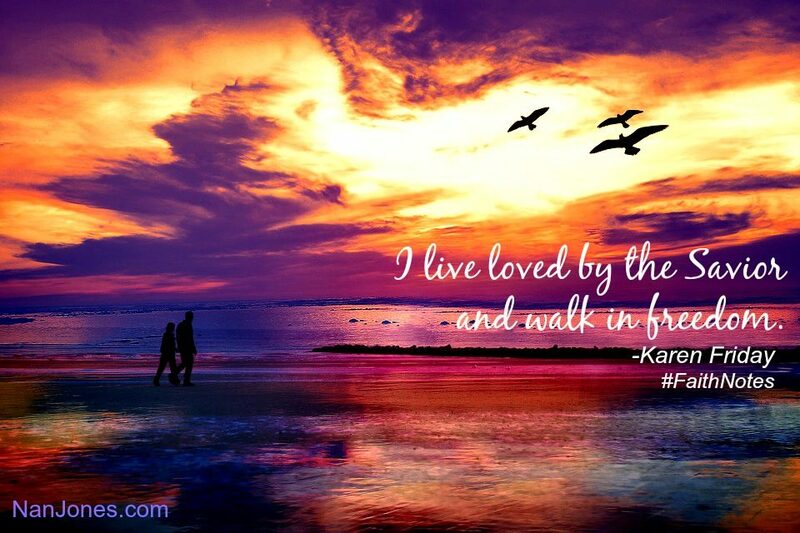 Karen Friday finds hope while learning to walk in the freedom of God’s love. Today’s guest on Faith Notes is a dear friend, Karen Friday, affectionately known as Karen Girl Friday. We met on Twitter a few years ago because she is a pastor’s wife and, well … I wrote a book for pastors’ wives. As it turned out Karen is also a writer and speaker, just like me. She has a precious, beautiful spirit fully dedicated to her Lord and delights in sharing hope with others. Be sure to read all the way through — Karen is offering a giveaway for those who subscribe to her blog! I’m sure her testimony will encourage you as it has me, because we are all on this journey of faith together. My biological father abandoned me during part of my childhood. When I accepted Christ as Savior at sixteen and started growing in my relationship with God, I guarded against comparing my heavenly Father to my earthly father. But a few years ago, a great sense of loss overwhelmed my life and soul. Thinking back, I never completely processed a number of sad events. It caused me to feel abandoned by my heavenly Father. I reached a breaking point and discussed it with the Lord. 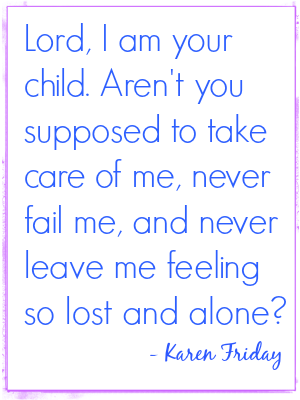 I am your child. Aren’t You supposed to take care of me, never fail me, and never leave me feeling so lost and alone? You see, for four consecutive years, significant loss plagued my story. Several marketing jobs I held ended with no warning. Financial stress became a constant, unwelcome visitor. And we lost both my father-in-law and my father within six months of each other. How could this be? No dads? Fatherless during holidays, special events, and life itself became our new family dynamics. My children would no longer have grandfathers in their lives. In addition, my grandson will never know his great grandfathers. Then the church where my husband serves as lead pastor suffered a tragic event. A young woman in our congregation died. Just twenty-eight, Jane passed away after a short illness. She left behind three small children including an infant son born only days before and family members with broken hearts and broken lives. My heart shattered in what felt like 1000 pieces no one could ever put back together. Our church family grappled to find peace and not lose heart. I once again felt the sting of loss––life’s slap in the face. With a sense of hopelessness, I arrived at a defining moment. Had I fully grieved all the loss? My father left my world again and this world––he’s not coming back this time. Could my heart withstand the gaping hole? Then there’s Jane. Her smile greeted me every Sunday morning. She loved our ladies Bible studies and the homeless ministry. We exchanged texts almost daily, sending mutual notes of encouragement, Scriptures, and prayer requests. I saved every conversation and sometimes still read them. Where is God when I need to find hope? Sleepless nights turned into robotic days—stunned and going through the motions as if life were normal…though it would never be. Deep and long-lasting peace seemed far away. I felt the Lord made a mistake. How could God allow this kind of devastation? I wanted the madness and the hard parts of life to cease. One summer day, a frenzy of emotions strangled my spirit. Tears soaked my face. Joining my husband on the screened-in porch, I fell into a chair and conveyed the frustration. “Mike, I told the Lord to please end the madness. To stop the hard stuff from happening. I can’t handle anything else. I can’t take any more bad news.” After I bared the rawness of my soul, the words seemed to hang in the warm summer air as if I could reach up and grab them. I discovered foundational truths about God in the midst of the darkness. Not only is the Lord a father to the fatherless, but He also provides supernatural peace, steadfast love, and help from on high for times of grief and sorrow. And while I can’t stop bad things from happening because we live in a fallen world, I hold on to the promise of these good things…best things that will never end. I will never lose God’s love, grace, faithfulness, or peace. It simply can’t happen. God showed me how He meets me in both the hoorays and in the hopeless parts of life. When Jesus touched my soul back at sixteen-years-old, He made me new, whole, restored, and free. No matter my circumstances, that never changes. And as I walk through the valley during the dark times, the Lord is with me and continues to restore my soul as only He can. (See Psalm 23.) I live loved by the Savior and walk in freedom. Yes, indeed I do! “Surely he has borne our griefs and carried our sorrows” (Isaiah 53:4a ESV). A prophecy years before being fulfilled in Christ and verbs that are past tense. Jesus has already won the victory over grief and sorrow. And like Christ’s blood, it spills over into present day, currently bearing our grief and carrying each of life’s sorrows. 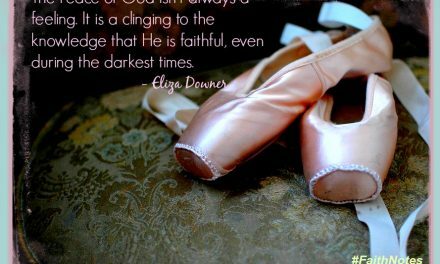 It doesn’t make it easy, but it makes us rely on His strength and only then becomes bearable. “And after you have suffered a little while, the God of all grace, who has called you to his eternal glory in Christ, will himself restore, confirm, strengthen, and establish you” (1 Peter 5:10, ESV). 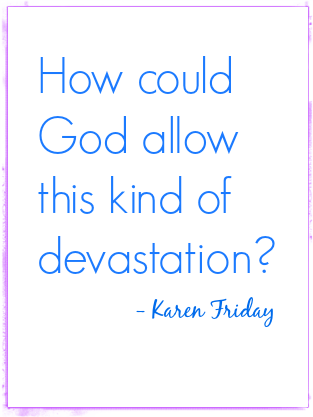 God himself restores, confirms, strengthens, and establishes me––not, Karen herself. However much of a fixer I am or try to be, I am incapable of doing this work in my own life. I must leave it to the great I Am. Worship, praise, and thanksgiving each played a vital role during this difficult season and caused me to be more faithful in that area in my day-to-day walk with Christ. It became my breath and life. When I praise my Creator and the presence of the Holy One enters my worship, there’s a peaceful release of the world’s cares. Worshiping Jesus helps me trust who He is and what He says. And smack dab in the middle of the loss, this lesson hit home in my spirit. 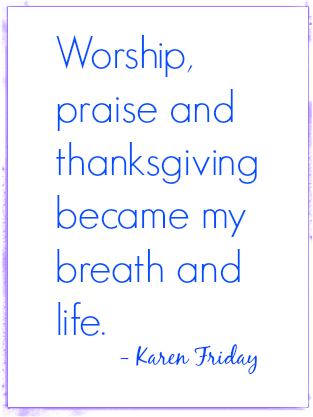 Praise helps me rein my heart back to God who’s worthy to reign in my heart. I’m amazed by Christ, in awe of Him. The Greek word for amazed means flabbergasted or knocked from a standing position. So, if I’m knocked from a standing position, I’m low. Falling on my face to worship and adore Jesus. It’s the place I need to position myself when life knocks me off my feet. One of my favorite passages in Isaiah, “For the mountains may depart and the hills be removed. But my steadfast love shall not depart from you, and my covenant of peace shall not be removed, says the Lord, who has compassion on you” (Isaiah 54:10 ESV). What a promise! The Lord’s love and peace never abandon me. God’s love will not depart from me and His covenant of peace will not be removed. A guaranteed pledge His peace can never be eliminated from my life. A peace exceeding what the natural world has to offer. It’s supernatural peace. An undeniable peace in an uncertain world only comes from God. I learned to set my hope on the peace-giver and promise-keeper, Jesus Christ. God is hope. Real hope only comes from the Lord who’s the source of hope. And the bonus? He fills us with joy and peace so that we abound in hope. That’s the icing on the cake! I have several writer friends who call themselves hope-writers. And because my blog theme centers around hope, Hope is Among Us, one friend calls me the “Hope Whisperer.” I claim and own the title. In my writing, speaking, ministry, mentoring, and faith-walk, I desire to proclaim God as the only source of authentic hope. Whispers of hope to a noisy world. He alone is our hope. Maybe you feel invisible, surrounded by loneliness, or lost in hopelessness. Or, you wonder if anyone cares, struggle with meaning in life, or you’re caught in a pit of despair. Perhaps you question God’s existence or love. Is God Real? Is God there? Does He know? Does He see? Friend, God’s always with us. 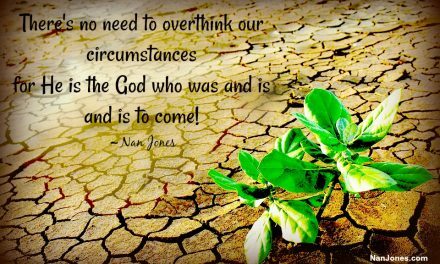 The heavenly Father never abandoned me even for one moment of time and He never abandons you for one second. The Lord knows, sees, and cares about anything we face. 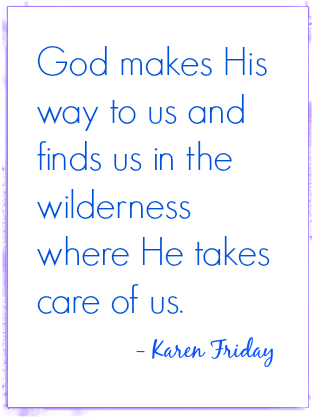 God makes His way to us and finds us in the wilderness where He takes care of us. And God offers a kissing-tear-wiping-make-it-better kind of love. Lord, I worship You seated on the throne, high and lifted up. 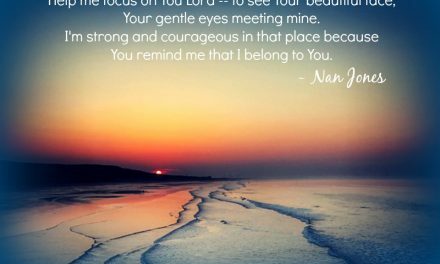 I magnify Your majesty and splendor. You are worthy to be praised and exalted. 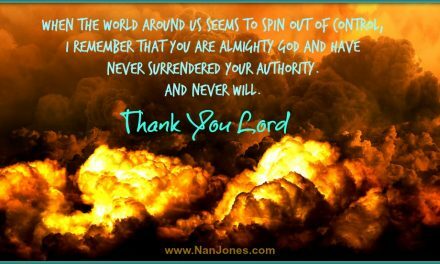 No matter what tomorrow holds, heavenly Father, You are good all the time and Your goodness never changes. Never. I cling to the promise that You are hope and give hope to me. And You are the peace-giver and promise-keeper. Help me rest in Your promises. Amen. Karen Friday is a pastor’s wife and women’s ministry leader. 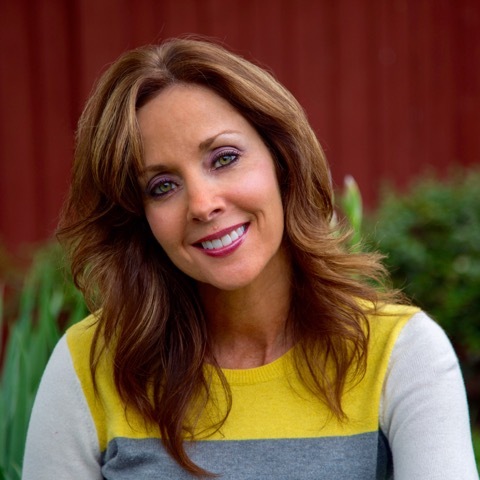 She’s an award-winning writer and avid speaker who loves words and God’s Word. For over a decade, Karen has balanced the busy life of church ministry with working from her home office in marketing and business development roles. Karen earned a communications degree and has experience in a broad spectrum of business services where she is frequently referred to as Girl Friday. A blogger, Karen “Girl” Friday engages a community every week. 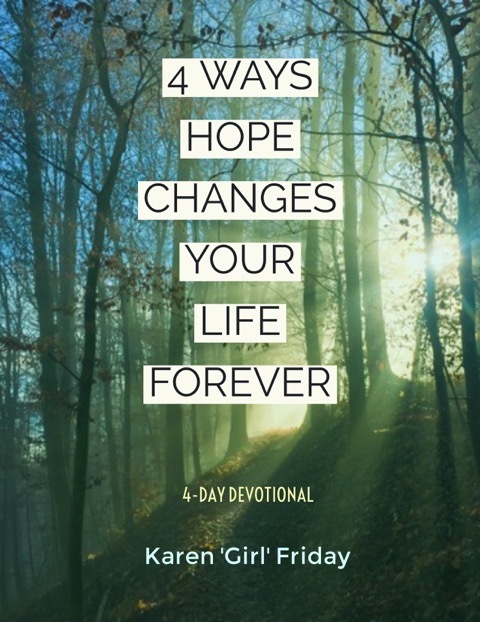 Hope is Among Us is an award-winning blog that expresses scriptural truths as life happens. Karen has published a number of articles and devotions in both print and online media and writes as a regular contributor for the national site, Inspire a Fire. She is currently working on her first book project. An inspirational speaker, Karen addresses a wide variety of audiences. She is passionate about mentoring and discipleship that helps followers of Christ live with authentic faith in real life. Karen and her husband Mike reside in East Tennessee and have two grown children and a grandson. The entire family is fond of the expression, “TGIF: Thank God it’s Friday.” They owe Monday an apology. Great resource if you’re trying to find hope. Two of my favorite ladies combining to offer much hope to a hurting world — how powerful! Karen, your story never ceases to move me. It’s a beautiful story of redemption. Thank you for sharing. Cathy, thank you to the dear one who deemed me the “Hope Whisperer.” 🙂 And yes, it is a powerful story of redemption from a good Father who offers hope, peace, and everlasting love the world knows nothing about. Hugs! Wonderful interview, Nan and Karen. I love the words: “He meets me both in the hoorays and the hopeless parts of life.” He is our Hope–always. Wendy, thanks so much. I appreciated Nan giving me this opportunity. And isn’t it wonderful how Christ meets us during any given moment or season in life? Of course we love the hoorays, but God is just as present when life becomes hopeless. Our only hope lies in Him. I appreciate you stopping by to comment with such encouragement. Blessings! Thanks for stopping by Wendy. You’re so precious. How comforting it is to walk in God’s abiding presence. I’m so thankful He opened my eyes to see. Yes and amen with heartfelt thankful tears. Thank you. Thank you for reading and commenting, Marcie. I know this for certain: God makes His way to us and finds us in the wilderness where He takes care of us. I’m a walking example of the Lord’s grace, mercy, goodness, and, yes, a hope like no other. Blessings and hugs! Isn’t it a wonderful testimony of God’s faithfulness and tender care. I’m so thankful Karen’s testimony ministered to you. Amen-Amein Sisters in Christ-Messiah Jesus-Yeshua! !